Working at Prosperity has been a wonderful 13-week internship. I’ve had a lot of fun keeping this blog updated. And I’ve learned a lot about the business and gotten great work experience. This is my final post, as I will be heading back to Purdue in a couple of days. This week I’ve taken Sarah’s books to Mooresville Feed & Seed to sell. There are now a few copies displayed at the cash register. I also went to a country store not too far from Prosperity where they expressed an interest in the books. They have a lot of hobby-farming customers who would be interested in learning how to make their operations profitable. And due to the convenient location, there may be some book signings in the future! Yesterday I got to work at the Indiana State Fair. I sat in the Normandy Barn and got to talk to scores of fair-goers and hand out recipes for the Family of Farmers’ recipe trail. The Striped Bass with Pumpkin Sauce may not have been the biggest hit of the trail. But quite a few people said they planned on trying it, and it would probably go well with the dirt pudding recipe from the next stop on the recipe trail. Also, upstairs at the Normandy Barn, paintings of Indiana artist, Douglas David were featured, as well as the photographs of the ISDA photo contest winners. Sarah’s “Hereford Haze” is the first picture you see as you walk up the stairs. It’s really a very nice display of pictures and paintings. If you’re at the fair, it’s also a good break to the indoors for air conditioning. On Monday I will begin my job as an advertising representative at The Exponent, Purdue’s student newspaper. Last semester I was a sales assistant, but now that I’ll have a territory and my own clients as an ad rep, I’m glad I’ve gotten some experience at Prosperity dealing with clients! I also write for a blog at Purdue. I am an admissions blogger, and maintain a blog for prospective students to read about life at Purdue. Once school starts I will be updating my “Boilermaker Life” blog again. You can keep track of what I’m up to at school on that blog. I am heading into my junior year, studying Sales and Marketing in the College of Agriculture. I’m looking forward to my new classes this semester, and hopefully I will have another fantastic semester at Purdue! Last Friday morning Sarah, Erin, and I got to attend Indiana Pork’s annual Ham Breakfast at the fairgrounds. It was bright and early at 6:45am. Governor Mitch Daniels and Lieutenant Governor Becky Skillman spoke briefly about Indiana agriculture and our wonderful state fair. 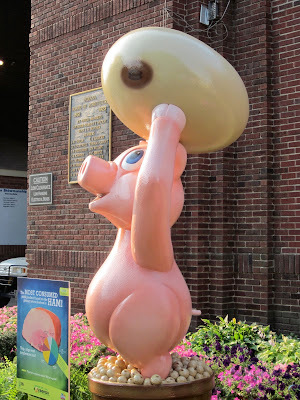 As the governor said, even though this is the “Year of the Soybeans”, every year is the “Year of the Pig” at the fair. And of course we got a yummy breakfast. The Indiana State Fair has officially begun! I only have one week remaining of my internship. For the final week I will be making phone calls to bookstores promoting Sarah’s books. The books are already sold in major bookstores such as Barnes & Noble and Borders. But we’re looking to have them in smaller stores around the state, a nice touch to local bookstores to feature an Indiana author. Mooresville Feed & Seed, past the Lowe’s, will be carrying a few copies beginning next week. More locations are to be announced. This week I will hopefully have the opportunity to work at the state fair a couple days with the Indiana Office of Energy Development. It’ll be good networking, especially seeing as it’s about time for me to start looking for an internship for next summer! I am open to suggestions, recommendations, and job offers. The agriculture world is very close-knit, as I’ve learned this summer. It seems as though everybody knows each other. I have a lot of people left to meet!